"My first impressions of the Warwick Alien were overwhelmingly positive. It looked beautiful. It felt great in my hands and balanced nicely on my lap. – the neck dives a little on its own like most ABGs but in normal playing position with your arm over the body it’s perfectly supported. The tone was great. 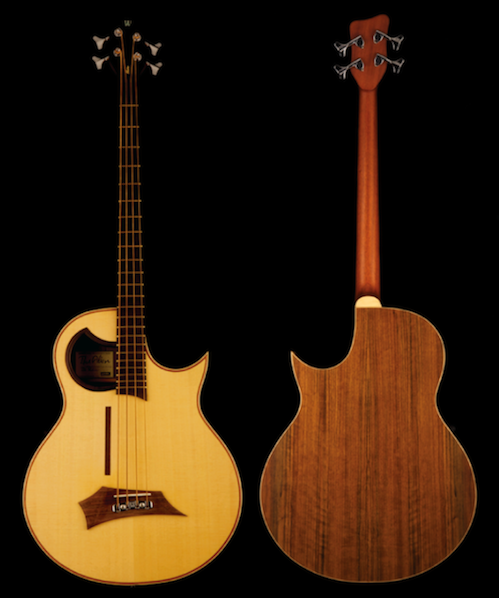 Really nice and woody, with the singing quality around the 12th fret that I had so admired in the Breedlove, combined with good bass extension down to the low E. Naturally it didn’t have the volume and weight of an upright, but the bass felt true. There was a satisfying hint of the famous Warwick ‘growl’, no doubt due to the wenge fingerboard and ovangkol back and sides. It was also supremely playable, with a slimmish neck and only slightly higher action than it’s electric counterparts. Playing in the kitchen, with its warm tones blooming in the natural reverb, was a revelation and within minutes I was completely hooked." I always wanted a top quality acoustic bass guitar, but the offerings from companies like Martin and Taylor were unfortunately only available in long scale. After reading the review above, I discovered that the Alien was a medium scale instrument. This top of the line Warwick Alien is a delight in every way. This bass is built in Vietnam by a well-known acoustic builder to Warwick’s exacting specifications, using technology and components supplied by Warwick. They were chosen for their proven acoustic expertise as well as meeting the demanding standards of Warwick. 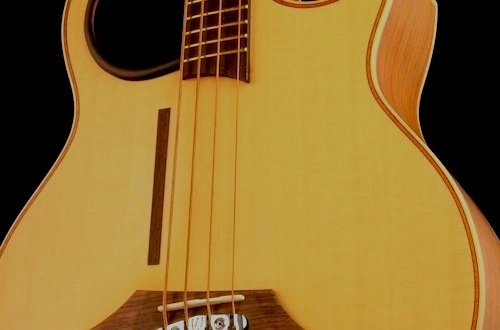 It is certainly one of the few medium scale acoustic bass guitars in existence. Sadly, I haven't been able to confirm it, but I have heard that this high-end model has been discontinued. That fact certainly adds to the value and collectability - but good luck finding one - this model in medium scale - new or used - seems to be in very short supply. This bass sounds loud, full and rich even without amplification. Finally, you can easily keep up with a couple of acoustic guitars without an amp - as long as you are in a small room. I love the versatility of the Fishman Prefix PlusT electronics. However, I always have to chuckle on high end instruments of this caliber. With all the electronic bells and whistles - nine times out of ten - I run everything into my studio signal path with the preamp "flat". I also love the convenience of the onboard tuner. Of course, being a pick player, I simply could not deal with that thumb rest as pictured above. It couldn't be more in the way and made the bass completely unplayable. So I decided to fly without a net - it had to be removed - and I enlisted my buddy and guitar guru - John Ingram and his associates - to get rid of it for me. Once John had removed the thumb rest we discovered - as in the the photo below - the manufacturer uses a series of exacto knife cuts into that perfectly beautiful spruce to make certain that the glue secures the thumb rest. Not a bad idea from a builders point of view, but an ugly mess if you are a perfectionist. Although the visual impact was minimal, I simply can't live with an instrument that has this type of flaw. So, in the end the perfect solution at my suggestion was to place and glue a beautiful super thin slice of rosewood veneer - the exact same size - where the thumb rest had resided. Here is what the bass now looks like and all is perfect. "Much has been made of the thumb rest on the Alien. It’s an interesting feature, seen on instruments ranging from vintage Fenders to Godins, but never universally adopted as essential. The most obvious reason for this is that most electric basses already have a rest, in the form of the pickup(s). From here you can maintain evenness of tone as you spider across the strings, grind away on that low B/E with authority, and anchor your hand position as you prowl the stage/throw those crazy rock’n'roll shapes. But what happens when you want to play away from this position? Sometimes the sweet spot isn’t bang over the pickups, or you want to introduce some variety of tone into your playing. You’ve just entered the hand position twilight zone. Understandably many players never go there. Why suffer the anxiety and indignity of your hand flopping effeminately about the lower strings like a regency dandy, when you can just weld your thumb to the pick up and give it some love? This is where the thumb rest comes into its own, and with the right height and spacing from the strings, it can free your fingers to leap about the strings like a young mountain goat. I’ve yearned for a thumb rest on many of my previous basses for precisely these reasons. So when I finally got my Alien I was particularly looking forward to this aspect of it. In reality however, it has turned out to be a mixed blessing. On the plus side it works beautifully in giving you a strong anchor point to play a wide range of positions, especially important with an ABG where there’s no knob for the volume or pan pot for the tone control, it’s all coming from your fingers. Having played the Alien for a couple of months now I’m tending to feel that an ABG doesn’t really need a thumb rest. In the seated position your arm has to come over the depth of the body and, unlike an electric, this gives plenty of support and enough strength to anchor your hand without needing a rest." This exciting medium scale fretted bass was crafted in Viet Nam under the direct supervision of Warwick and has a set neck and a laminated spruce top. The back and sides are made of ovangkol, with a remarkable circular grain pattern on the back. The neck is mahogany with a satin finish while the fingerboard is wenge. There is a natural highly polished top, while the back, sides and neck are finished in satin. It has a rosewood bridge with bone saddle and slotted bridge pins. The Alien is a surprisingly light 6.2 lbs and the width of the neck at the nut is 39mm. The bass is equipped with the Fishman Prefix PlusT electronics which provides - a variable notch filter, shelving bass & treble, semi-parametric contour and brilliance controls - for precise tone shaping. There is also a phase reversal switch and low battery indicator along with a built in tuner. All hardware is chrome, including the Warwick tuners. It also includes their patented "Just-A-Nut III" system. The incredible craftsmanship has to be seen up close in order to fully appreciate the beauty of this bass. 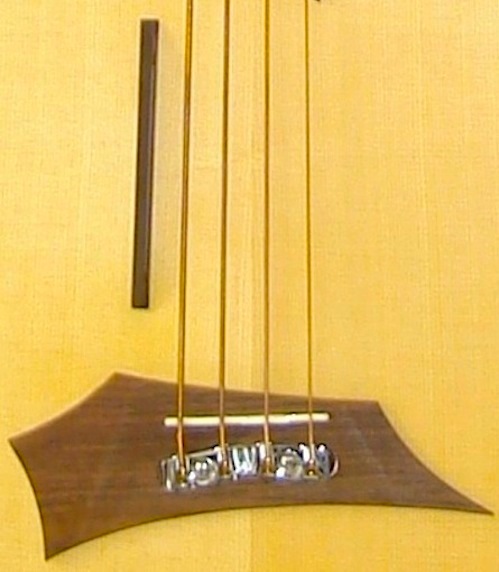 It comes strung with Warwick Red Strings bronze acoustic bass strings: .045" - .105"
Strings: Warwick Red Bronze Acoustic Bass Strings / Medium Scale: .045" - .105"
Please click on any of the photos directly above to proceed to those pages. © 2014, innertainment, all rights reserved .